Join Tysons Biergarten in Yahoo.com‘s Tourney Pick’em for NCAA March Madness! We’re giving away $100 CASH to 1st place, a $100 Biergarten gift card to 2nd, and a $50 Biergarten gift card to 3rd. Register before March 15th to be included. Join our group by clicking here or using the group ID 7773! 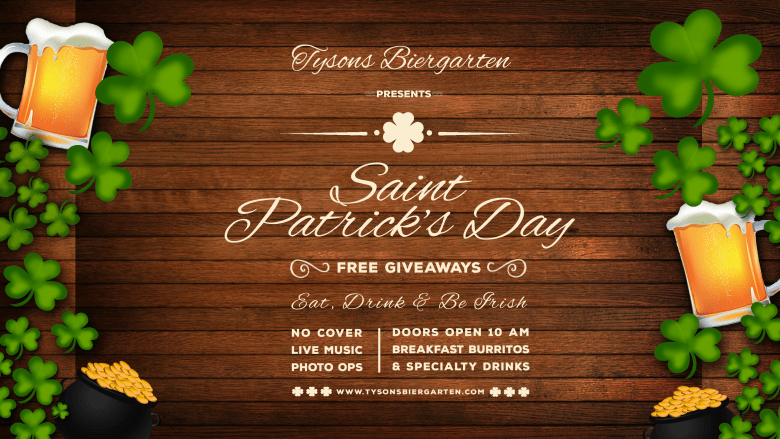 We know you’re all counting on Tysons Biergarten to provide a passably Irish experience on St. Patrick’s Day, and we have you covered! Whether you’re sticking around Tysons and NOVA or heading to DC to party, you can make TBG your first stop (not to mention our convenient, steps-from-the-Greensboro-Metro-station location). It’s… the St. Patrick’s Day All-Day Pregame! -Our kitchen will be making BREAKFAST BURRITOS until supplies run out! Eggs and German sausage, mmm. -Giveaways! You get a bead necklace! You get a bead necklace! Pretty much everyone gets a bead necklace and a color-changing cup! -LIVE MUSIC starting at noon!! With a focus on Irish music! -And, best of all, no cover!! RSVP on eventbrite here and Facebook here! 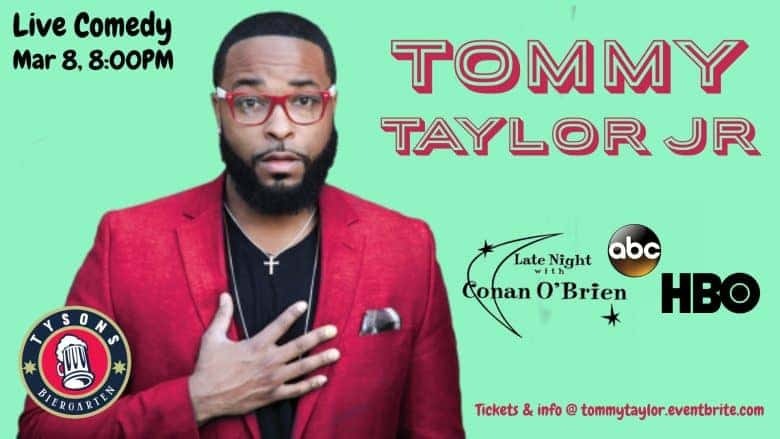 Join us at Tyson’s Biergarten on Thursday, March 8th to see the hilarious Tommy Taylor Jr! tommytaylor.eventbrite.com for tickets, and you can RSVP on facebook here. *He’s also the producer of TheTommy Taylor Show; And award winning videos, commercials, and films. Parking is free. Instructions in a separate post, but the easiest thing to do is put Tower 1 Garage, Tysons, VA in your GPS. Then walk over from the garage. If you metro Tyson’s Biergarten is only steps away from the Greensboro stop.